I started carrying my eldest within weeks of her being born as prams are a bit of a bind on these steep hills with their narrow pavements. 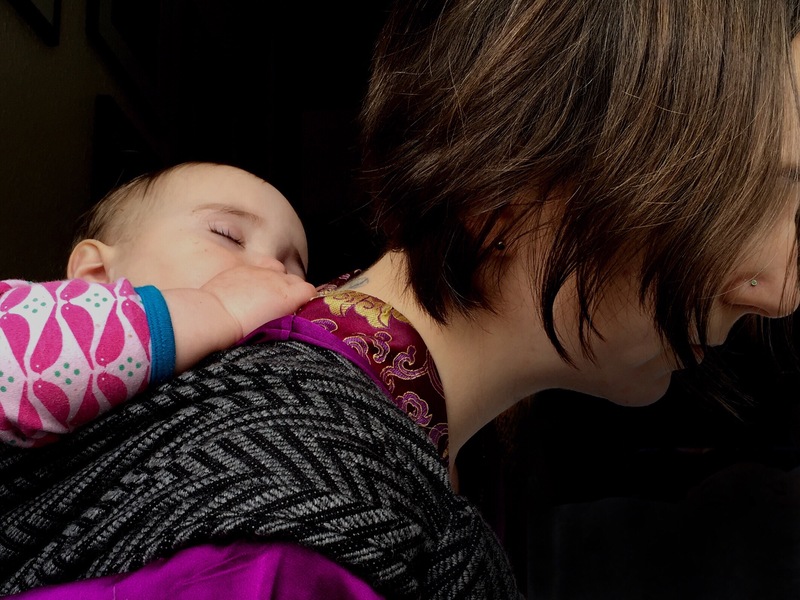 I stopped carrying her at the age of two years and nine months: a week before I gave birth to Smallest. 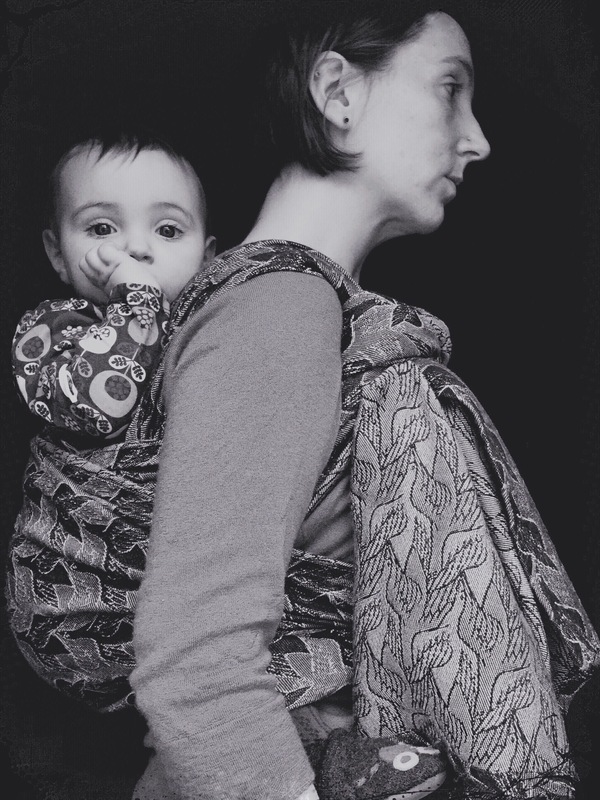 I had dabbled very briefly with wraps during that time but they seemed like such a faff so we stuck to soft structured carriers. 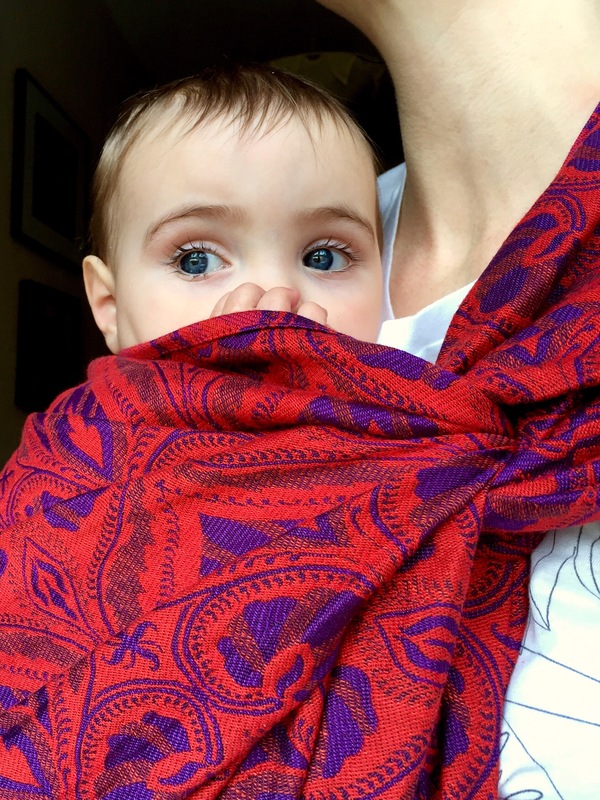 I got wrap curious around the time I was ordering a custom Madame GooGoo, made with a vintage Didymos Indio, for Smallest. I happened to acquire a wrap again. Not just any, but a beautiful silk and cashmere one. I wanted to dive into the world of wrapping but still the enthusiasm eluded me. Fast forward a few months and I bought a tussah silk shortie which became the perfect rebozo. Down the high end wrap rabbit hole I went. In reality though, I’ve only been wrapping full time since about September 2015. I’m a sloppy wrapper and very much still learning. I had seen the 30 day wrap challenge posted about but always thought it looked way too hard and fiddly in the way that I saw wraps to be. It wasn’t until a Facebook group of wrappers suggested doing the challenge for January that I dared to give it a try. The challenge is a different carry with a woven wrap for every day of the month, so 30 days in total with an additional blooper photo for day 31. As I mostly use a FWCC, double hammock, a Robins hip carry or a ruck this was clearly going to broaden my repertoire. First of all it’s pretty hard to do this if you work full time as I do. For the first week I was working at home so had time to wrap and photograph in the morning before I dropped the girls off with our childminder. So far so good. I realised however that getting slightly stressed and sweaty trying out a new carry as I was bundling the girls off and hauling my laptop to work wasn’t going to happen. So I semi cheated and did them all at the weekend. Even that’s not easy as learning, wrapping and photographing 7 carries over 2 days is still pretty full on. As Smallest was a bit on/off about being patient whilst I hauled pieces of fabric about I started wrapping my eldest more and more. Then I traded a wrap for another heavy one that would suit her, and Smallest, as it was fun for both of us. She was totally up for draping her body against me and watching Hey Duggee or another Octonauts whilst I tightened passes and got the carries right. She equally adored posing for the camera. Most of all we both loved the closeness and connection the challenge brought. Another unexpected off shoot was the challenge of photographing the carries well. I’ve always meant to try and improve my selfie skills when it comes to documenting carrying the girls and the challenge was perfect for this. Every weekend I’d shoot the carries and edit the photos for uploading to Instagram day by day during the week. I discovered lots of #30daywrapchallenge photos which were interesting to look at and compare against my middling efforts. I loved sharing the photos in the group of women all attempting the challenge. There was a thread each day with a tutorial at the top and a witty photograph to accompany it. For the first time I didn’t feel intimidated at the thought of all these hugely experienced wrappers posting photos because the truth was that the challenge included lots of carries many had equally never tried. The bloopers thread (extensive) was an incredibly funny record of the month that had as many fails as wins for different carries. So the main point of the challenge is to broaden your repertoire of carries and that certainly happened. 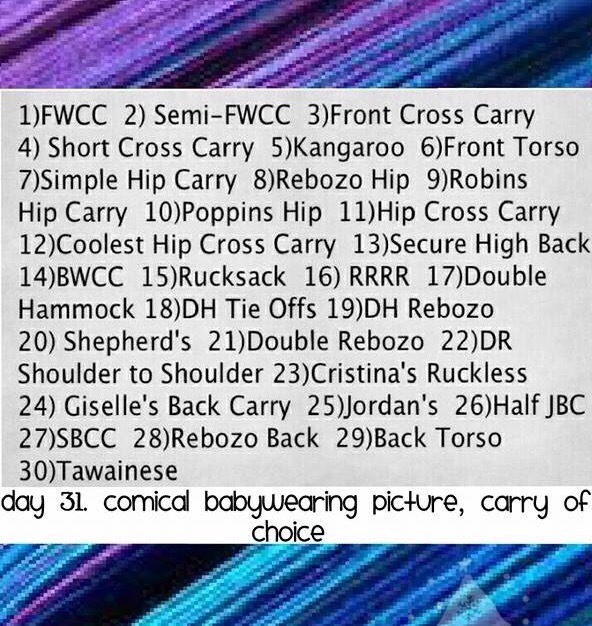 I finally mastered carries that had evaded me (Coolest Hip Carry, Poppins Hip Carry), discovered ones I, and Smallest, loathed (Hip Cross Carry, back and front torso carries, Cristina’s Ruckless) and found new ones I absolutely adored (full and Half Shepherds Carry, Jordan’s Back Carry, Giselle’s Back Carry, Double, and Double Hammock, Rebozo, Secure High and Short Back Cross carries). I finally did a candy cane chest belt and realised what the fuss was about (so comfy). The challenge makes use of every size wrap from a shorty (2) right up to base size +1 (6 for me) so I got to use every wrap I own more than once. It was brilliant. I learned why I liked some wraps in particular and which suited certain carries. If you’re considering trying the challenge but feel daunted or not experienced enough then I recommend finding a group of wrappers and just getting stuck in. Brilliant fun that furthered my love of wrapping and why it matters for us. I documented the challenge on my Instagram account – @drcrow.